Proudly Serving Drivers Like You from Fort Lauderdale to Hollywood, Pembroke Pines, Hialeah, and Miami, Florida! If you’re in the market for a new or used car, you’ve come to the right place. The staff at Toyota of Hollywood is committed to helping you find the right vehicle for your needs. What’s more, we’re also dedicated to helping you maintain it long after you drive it home for the first time. So where do we begin? 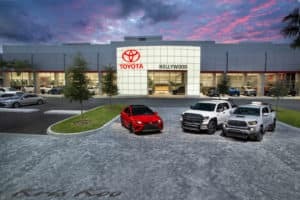 Most like to take a look at the latest Toyota models to hit our showroom including the popular Toyota Camry, Corolla, Prius, Tacoma and Tundra. Those looking to keep some of that hard-earned money in their pockets, meanwhile, like to consider our lineup used cars as well. Of course we also provide auto financing specialists on site who can help you find the right loan or lease for your needs. From start to finish, we’re by our side to make the buying process as easy as possible. Whatever your automotive needs may be, Toyota of Hollywood is here to serve you. Our dealership is located at 1841 North State Road 7, Hollywood, FL 33021. We’re a quick drive from the surrounding areas of Fort Lauderdale, Davie, Pembroke Pines, Hialeah, Boca Raton, and Miami areas. We serve the tri-county area of Palm Beach, Broward and Miami Dade County. Come see what we can do for you today! $0 Down True Sign and Drive Leases with Tier 1 Credit 740 + beacon score qualifier. Includes 1st payment, New Tag, $899 Dealer fee and 12,000 miles allowance per year with no security deposit required. At the end of this page you will have an opportunity to receive additional information on products and services from your dealer and/or continue on with your credit application. Your car is valuable. It allows you to get to work on time every day, it brings home the groceries from the store so you family can enjoy the food, it takes you to places you love to be and it allows you to visit friends and loved ones. Toyota of Hollywood	26.0259367, -80.2082059.